Windows 7/8/10 come with over 200 fonts pre-installed. 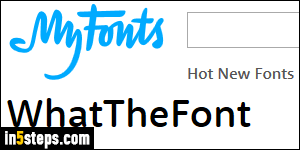 You can view them from the Fonts dialog of text editors like Notepad or MS Word, or by typing the word "Fonts" in the start menu and hitting Enter. 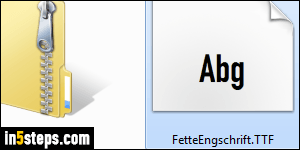 That will open your system fonts folder, whose directory location is "C:\Windows\Fonts". Double-clicking on any font family opens Windows' font viewer: fonts shown in a stack have separate versions installed for regular, bold, italic, bold italic, black, narrow, etc. 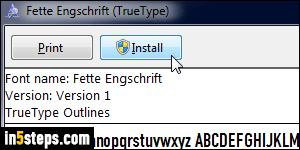 Windows supports the following font formats, with the corresponding file extension shown between parentheses: TrueType (TTF/TTC), PostScript Type 1 (PFB/PFM), and OpenType fonts (OTF). And it still supports the old FON format: these are "bitmap fonts", which do not resize well since they only come in a preset, limited number of sizes. Sometimes, cross-platform fonts include multiple formats in the same zip file, so pick a supported format! 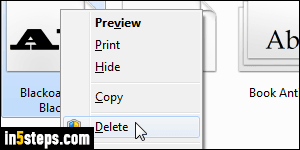 To add a new font, double-click on it to open it in Font Viewer: then, click on the Install button. Depending on your User Account Control (UAC) settings, Windows may ask you to enter the administrator's password before installing the font. (Yes, it's weird that Windows would require elevated privileges just to add a font to your system, but that's the way it is :) If you already have that font, you'll get the "The [font name] is already installed. Do you want to replace it" message. Click No unless you are updating to a new version of the font. 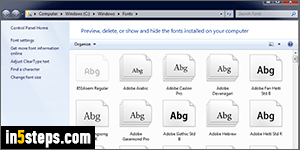 Programs that let you pick fonts typically load the list of installed and compatible fonts when the application launches (typically), or when the list of fonts is requested (when you click on a menu to pick a different font, for example). 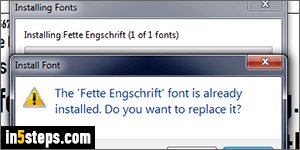 To be able to see and use your new font, you'll need to restart that program. New fonts can be downloaded from websites like MyFonts.com, where you can legally buy fonts (I've used them many times - they also have an awesome tool to identify a font online, called "WhatTheFont" :) There are also many websites from which you can download free fonts, but stick to well established / reputable sites like DaFont.com before downloading anything on your computer! - It's just as easy to remove fonts you no longer need: they take up memory (RAM), so the more fonts you have, the slower your system can become!